Sunset over ripples in the sand at Great Sand Dunes National Park & Preserve. This year I have been trying to cross things off my to-do list that have been on there for way too long. 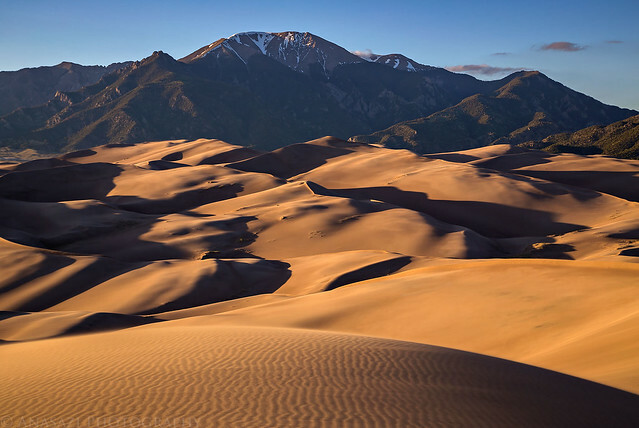 One of the items on my list that I have been looking at for a number of years was backpacking into The Great Sand Dunes. Earlier this year I decided that this was finally the year I was going to go for it! After some research it looked like June would be a good time to go. 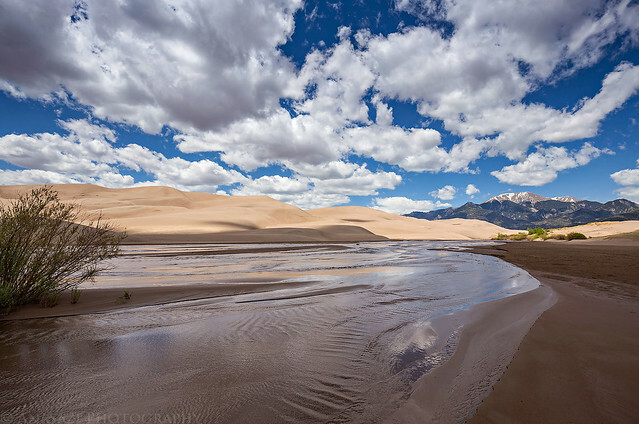 Even though Great Sand Dunes National Park is usually pretty busy in June since Medano Creek is typically at peak flow, I figured it wouldn’t matter much for us since we would be hiking and camping deeper in the dune field than most visitors go. Looking at my calendar, my only free weekend in June was the very first weekend (It’s going to be a busy month! ), which was a little earlier than I would like to have gone, but since it was our only option that’s when we decided to go. I left work early on Friday so we could start our drive down to the San Luis Valley and find somewhere to camp before it got dark out. We grabbed something to eat in Gunnison and then continued on through The Cochetopa Hills and over the Continental Divide to Saguache. 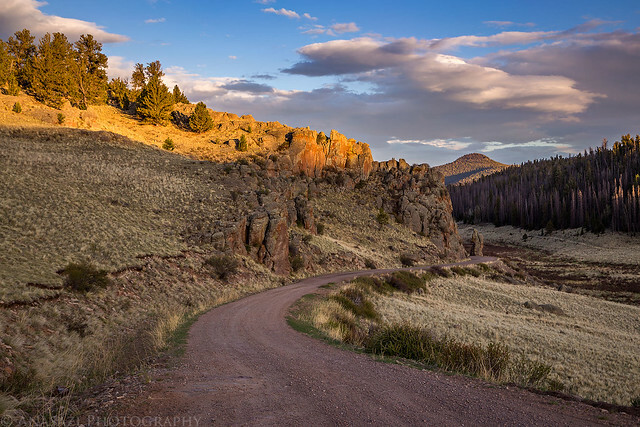 When originally planning this trip I was hoping we’d be able to find a campsite along Medano Pass Road inside the Park, but after checking on the status of the road I found that it was still closed while they repaired a washed-out section. 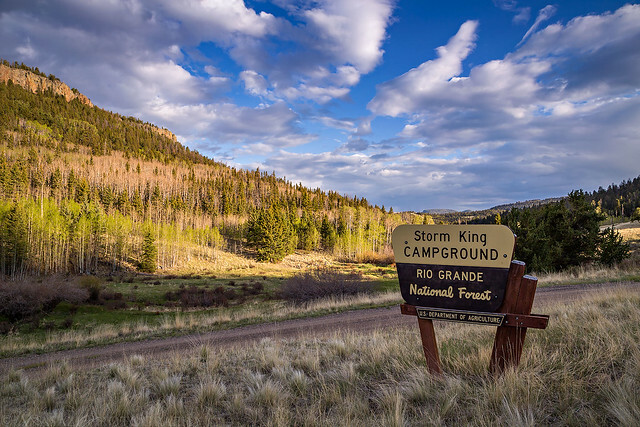 As we left town I was hoping we’d be able to find a place to camp near Zapata Falls or along the road to Lake Como since I knew the campground in the Park would be full on a Friday evening at this time of the year. 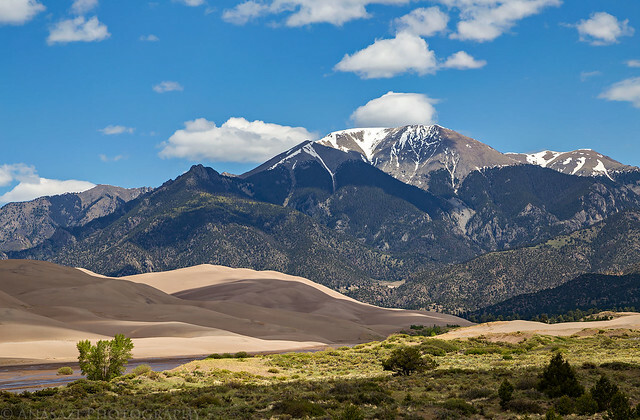 However, I was still a little concerned that we wouldn’t be able to find a place to camp near the Park, and if that happened we would most likely have to drive back across the San Luis Valley to find a spot in the National Forest. With that thought weighing on my mind, I made a last minute decision to just find a place to camp on the west side of the valley and drove up Carnero Pass Road in the La Garita Mountains to see if we could find a dispersed campsite. Then we would finish the rest of the drive in the morning since we would have plenty of time until the Backcountry Office opened. As we drove up the road to the pass we didn’t see any dispersed campsites, which is pretty uncommon, and were worried we weren’t going to find a place to spend the night here, but shortly before reaching the pass we came across the Storm King Campground. It was a nice place located at around 9,000 feet at the base of Storm King Mountain (10,849). There were six sites and only one site was currently occupied by a bikepacker, so we decided to spend the night here. We quickly setup camp and had a little extra time before sunset, so we drove the rest of the way up to Carnero Pass (10,171) and explored a few of the side roads in the area. We returned to camp at sunset and went right to bed so we could get up early on Saturday morning. We found a nice spot to camp in the Storm King Campground. Out exploring the Carnero Pass Road before sunset. Driving next to a large pinnacle along the road. A little color in the sky as we returned to the campground for the night. 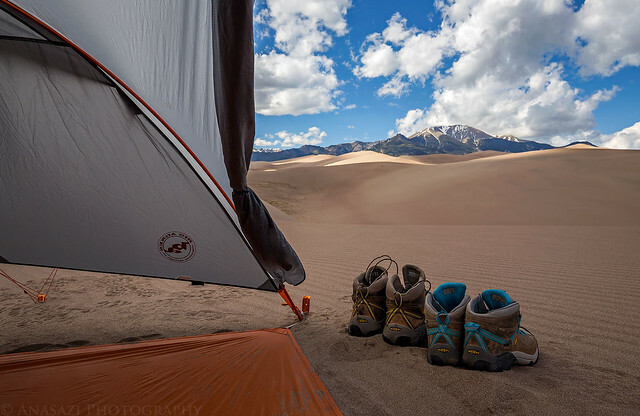 We woke up with the sun at 5:30am on Saturday morning, packed up camp and then drove across the San Luis Valley to Great Sand Dunes National Park & Preserve. We arrived about an hour and a half before the Backcountry Office was supposed to open and were already the sixth group waiting in line for a permit to camp in the dunes. 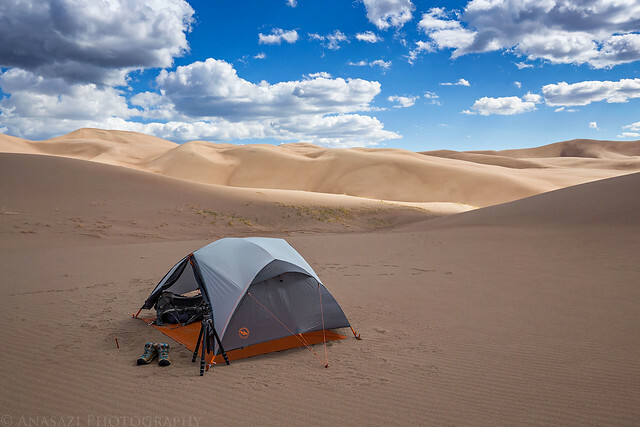 The Park only allows 20 groups to camp in the dunes each day and since it was the busy season I knew we might need to arrive early in order to secure our permit. After the office opened and we received our permit we went for a drive along Medano Pass Road since they had finally opened it late on the previous day and it would give Diane a nice overview of the Park since this was her first visit. 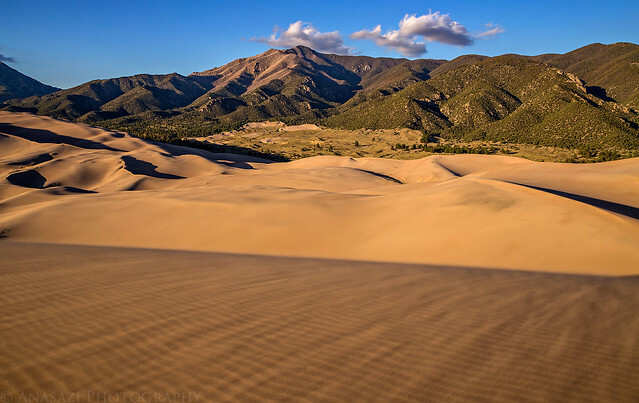 When we were done with the drive we returned to the main parking area so we could hike out to Medano Creek and the base of the giant sand dunes for a little while. There were a lot of people around and many more coming so we left the Park for a little while to get some lunch before returning to hike into the dunes to set up camp. Mount Herard towers above Medano Creek and the sand dunes. As we were hiking out into the sand dunes early in the afternoon there were a lot of nice clouds in the sky and I was really hoping they would stick around until sunset. When the sun was out it was pretty warm out, but when the sun was blocked behind the clouds the temperature was very nice and comfortable. After hiking for a few miles and exploring the dunes we found a nice spot to set up camp that we hoped would be a little protected from the wind if it kicked up. There was also a pretty nice view of Mount Herard (13,340) from our tent. Since we had a few hours until sunset we only set up the footprint with the rainfly so we could use it for shade from the sun and avoid getting too much sand inside our regular tent. We would spend the rest of the afternoon exploring the area and resting in the shade. It was a pretty relaxing afternoon. Arriving at the edge of Medano Creek as we prepared to cross and hike into the dune field. Diane crossing Medano Creek ahead of me. 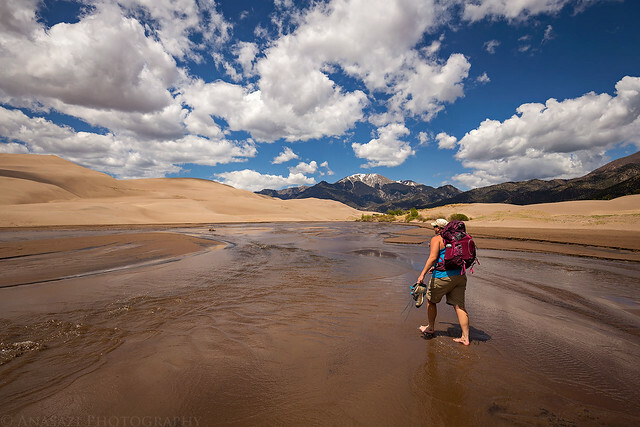 Hiking across the sand dunes in search of a place to camp for the night. Not a bad view from inside the tent. Unfortunately, the nice clouds that had been around all afternoon started to disappear later in the day and the wind really started to pick up. 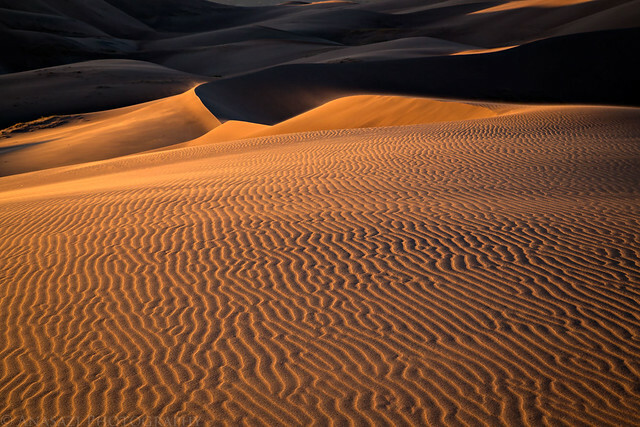 About an hour before sunset we headed back out into the sand dunes with my camera so I could take some photos. As we were hiking around the wind really started to blow. I had checked the weather a number of times in the morning and afternoon and according to the forecast only light 5mph winds were expected this evening and tonight. But as we hiked to the top of a large dune we were greeted by a very strong winds that had to have been gusting at least 30-40mph. 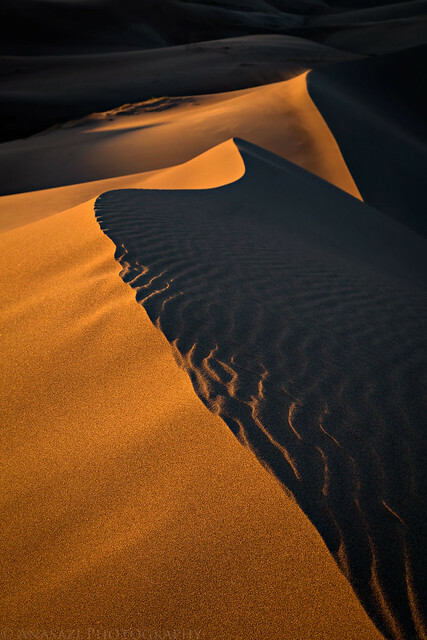 We couldn’t even get over one of the dunes we were on because it was blowing so hard and creating a very soft pointy ridge at the very top. 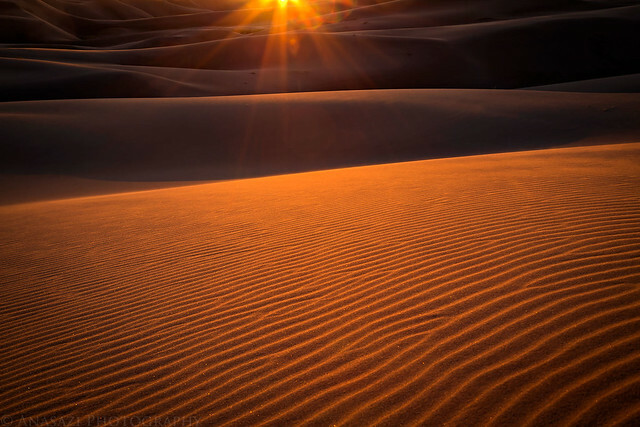 In some places the sand was whipping across the dunes and erasing our footprints almost as soon as we left them. I wanted to try and take some long-exposure photos of the blowing sand, but it was too strong for my tripod to stay upright. 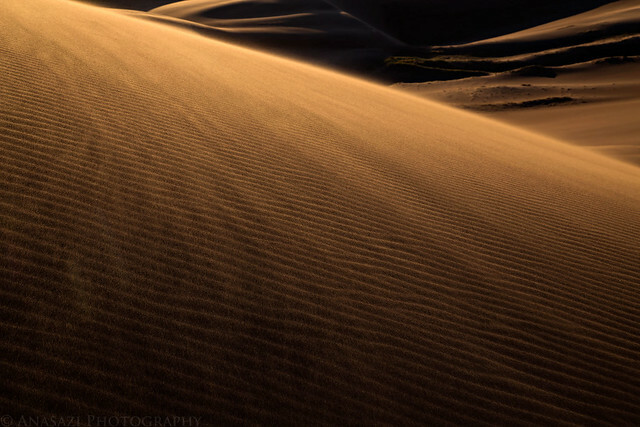 I braved the wind and took photos until sunset and then returned to camp hoping that the wind would die down soon. It didn’t. You can see the sand blowing over the ripples at the bottom of the photo with Mount Zwischen (12,006) in the distance. 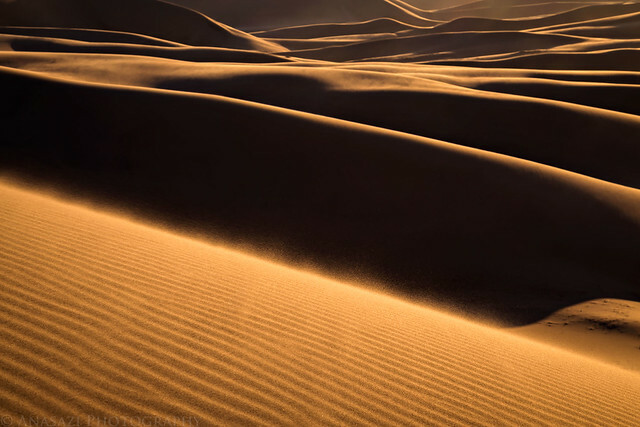 Here’s a very short video of the sand blowing that I took with my iPhone. Sorry for the vertical video, but it was the only way I could show the sand blowing across the dune at the bottom with the mountain in the distance. 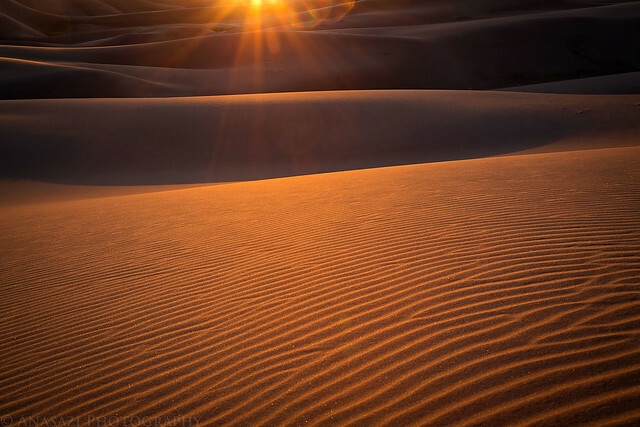 More sand blowing over ripples. 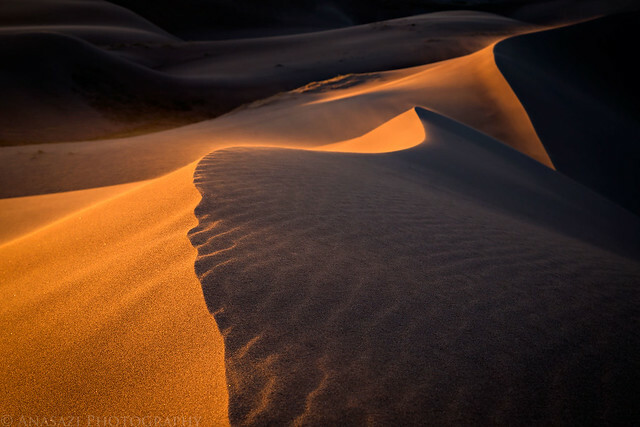 Just a large sand dune. Check out that fresh pointy ridge on the top! Not a bad view to battle the wind for. 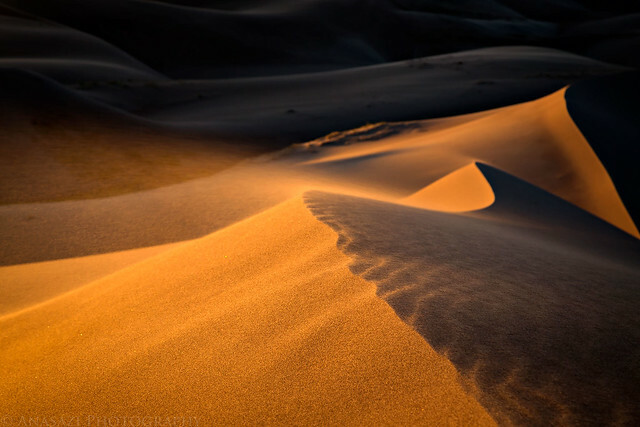 A closeup of sand blowing off the crest of this dune. 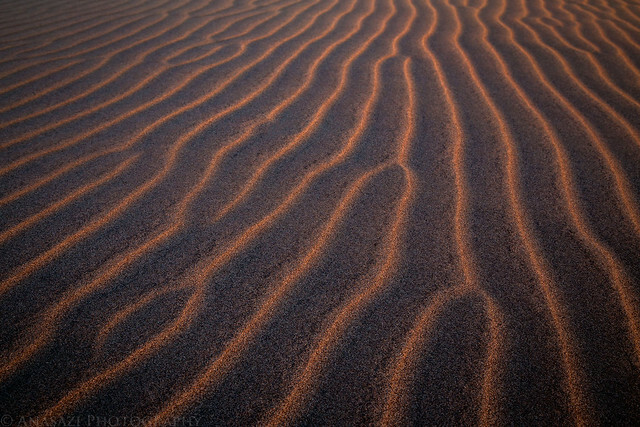 Low angle light striking just the very top of the ripples in the sand. Our shelter as the sunset added a little color to the only clouds left in the sky. Thankfully, the location I had setup our tent was definitely better sheltered than some other areas, but even so, it was still getting pummeled by the wind. We were hoping the wind would die down after the sun had set like it frequently does in the desert, but it actually seemed to get even stronger after the sun was down. We put up the tent under the rainfly and tried to keep sand from blowing in, but it was a futile effort. 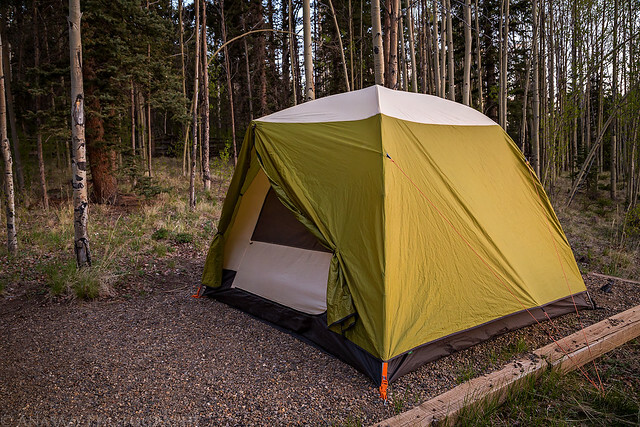 The wind on our tent was steady, but the Big Agnes Copper Spur UL3 handled it like a champ, never flattening or collapsing. Over an hour after sunset conditions hadn’t changed and we had to figure out what we were going to do. 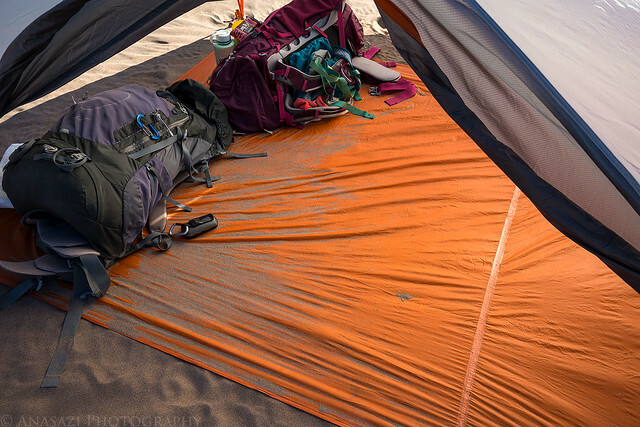 We couldn’t keep sand from constantly blowing into our tent, and even if we could there was no way we would be able to sleep in this wind. At this point we decided that it would be best just to pack up camp and hike back out. 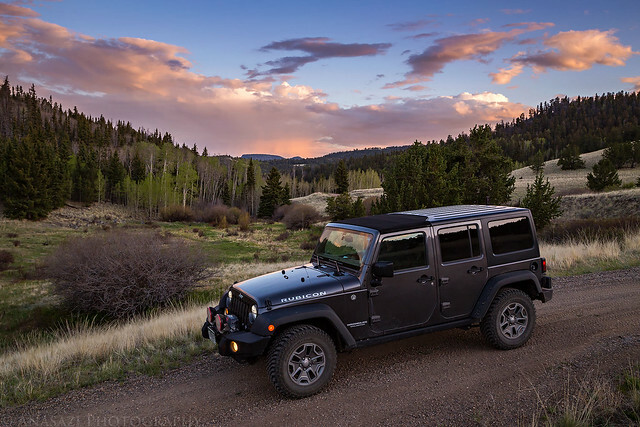 It was only a few miles back to the Jeep and the moon was still out to provide a little additional light. We got everything packed up into our backpacks as quickly as possible in the blowing sand and then started hiking back out over the dunes. Shortly after starting the hike out we ran into another couple of backpackers doing the same as they had come to the same conclusion as us, so at least we weren’t the only ones leaving. On the way out I would turn around a bunch of times and see groups of headlights behind us- other groups of backpackers leaving, too. It was that bad! 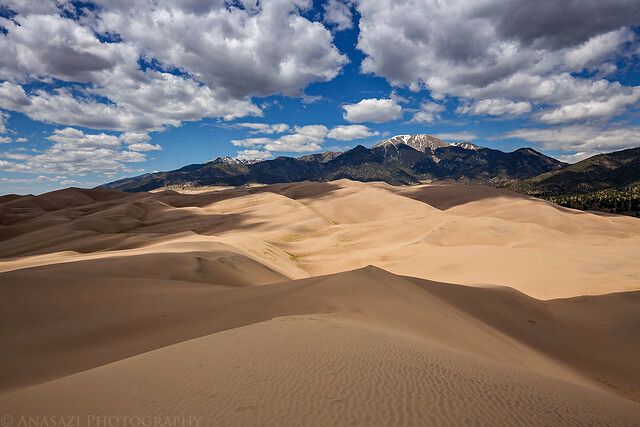 I’m just glad we hadn’t hiked into the dunes any further than we did. Even though making the decision to leave was a tough choice for me to make, I knew it was definitely the right one. The hike out would reassure me of that! The wind was brutal and it was coming straight at us the whole way out. It had to have been between 30-50mph, at least. Not only were we getting coated with sand (It looked like we were walking through a blizzard with our headlamps lighting up the sand in the air), but it was also sandblasting our faces and eyes for most of the hike. It was a pretty painful experience and we would have to cover our faces and walk with our eyes closed, carefully peeking out just enough to try and keep on track. It was not a very pleasant hike. 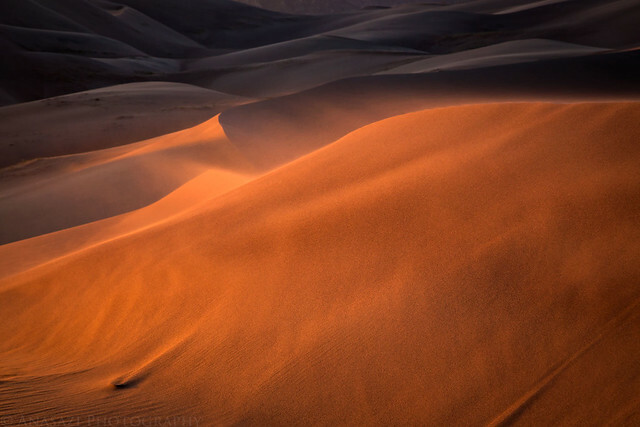 The worst part was having to cross the higher part of the dunes where the wind was the strongest, constantly blowing sand over the ridge and it had created very soft and steep points that were tough to get over, especially with the sand blowing right at you. Eventually we made it over the main ridge of the dune field and down to Medano Creek, which we crossed and then finished the hike to the Jeep. When we returned to the trailhead it was getting late and we were pretty exhausted. I thought it would be best just to drive to Alamosa, get a hotel room, take a shower and go right to bed. Who knew that all the hotels in Alamosa would be full on a Saturday night at 11:00pm? 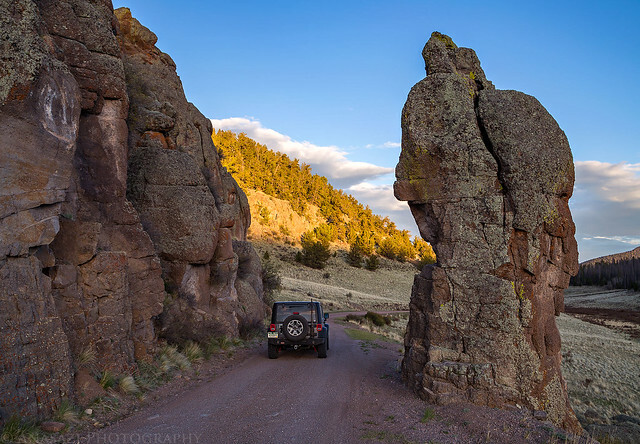 Since we couldn’t find a room in Alamosa or Del Norte and I was getting too tired to drive much further, we returned to Carnero Creek and setup our tent at a trailhead we had seen earlier in the morning. We went right to bed, but it was still a bit windy on this side of the valley, too. The wind would keep hitting the tent throughout the night and prevent me from sleeping well. We slept in on Saturday as long as we could. 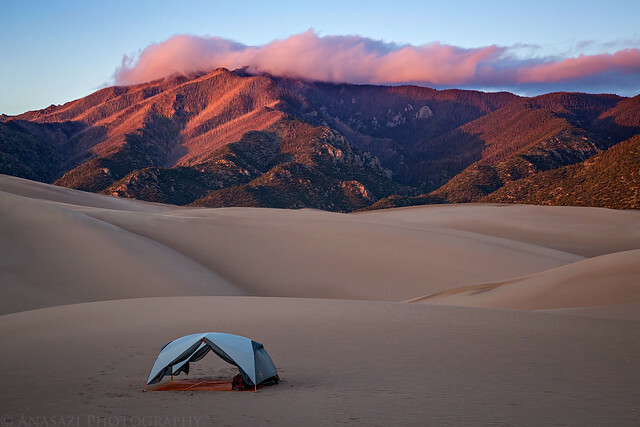 Once the sun was up and the tent was too hot to be comfortable it was time to get up. We were both still pretty tired, so we packed up camp and drove back home, calling it a weekend. I would take a nice nap as soon as we returned home. Awesome photos and story. I’d have hiked out as well. That wind sounds unbearable. Did stakes alone keep your tent anchored in that wind? I’d imagine it could be rough keeping it in place in such soft sand with high winds. Jackson, I had purchased some snow/sand stakes from REI and they really worked pretty well. Plus the sand was wet and pretty solid below a thin layer of soft sand, so they held good. Quite an adventure! 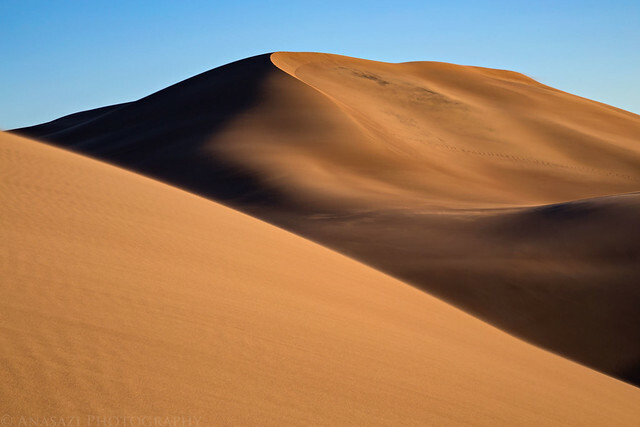 Walking on those dunes is difficult even in nice weather but you had to endure windy conditions at night! The photos are stunning, as always!